Desensitizing/Despooking Natural Horsemanship Clinics, can be scheduled with me if your schedule does not allow you to attend one of my other clinics and we do not already have another clinic scheduled. 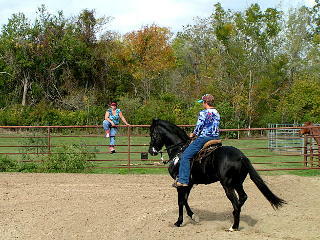 You choose how many days you can attend, and we will get you scheduled to begin a new experience with your horse. These clinics can be held here at Rose Hill Ranch or at your facility. Travel expenses will be the responsibility of the host/participant in addition to the clinic cost. The Desensitizing/Despooking Clinics are specifically geared to removing the fear from your horse to provide a safe experience for both of you. Although many of these exercises may be included in a one day clinic, it is not necessary that you have all the groundwork down to desensitize or de-spook your horse as is required in the one day clinics. If you can get him in the trailer and keep him on a lead line safely, I can help. If you are not able to trailer and lead your horse safely, I would strongly recommend a 2 Day Clinic, 5 Day Clinic, or a 10 Day Clinic to give you and your horse the basics for safe horse handling. Understand that this is not always an easy fix and it requires work and dedication to results from participants. I will lead you through the steps to achieve Leadership, Direction, Respect, and Trust so that you can begin to enjoy your experiences instead of waiting for the next horseshoe to drop! Please bear in mind that we cannot retrain a horse in one or two days, but by gaining his Respect and Trust, we can take him through issues that you may not otherwise be able on your own. Not only will you build your confidence and your horses, but you will establish yourself as a trusted leader with your horse. The cost for the 2 day clinic is $400.00 per person, this includes one stall per attendee. You will need to bring your own feed, hay, and shavings. Please use the easy contact form below to get started! Please Log in or create your account then revisit this page to provide details related to your potential desensitizing/despooking clinic.